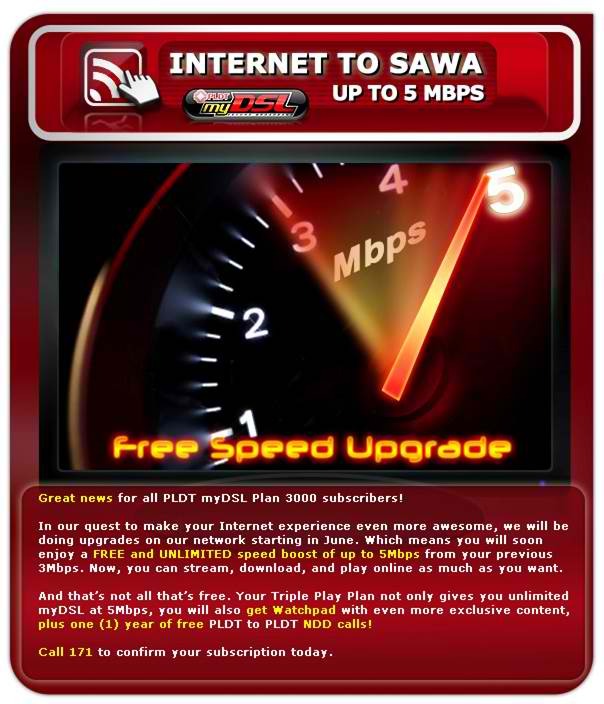 PLDT myDSL’s Internet to Sawa TRANSFORMS my Internet experience from 3Mbps to 5Mbps FREE! The Philippines is not only known as the SMS Capital of the World. Recently, the country earned the crown as the World’s Social Networking Capital. Being the country that penetrates trending topics in Twitter and is one with the most number of subscribers in Facebook, we, Filipinos, always wanted to stay connected online. That’s why the need for a high speed connection is getting necessary for every household. If you’re in PLDT myDSL, then this good news is for YOU! PLDT will be doing an upgrade on their network starting this month of June. Soon, you’ll enjoy FREE and UNLIMITED speed boost of up to 5Mbps! Plus, your Triple Play Plan will not only gives you unlimited myDSL at 5Mbps, you will also get Watchpad with even more exclusive content and one (1) year FREE PLDT to PLDT NDD calls! Enjoy this extra ordinary transformation you can get from PLDT myDSL Internet to Sawa and transform your Internet experience to the next level! As for me, not only do I get to experience a great online adventure with this 5Mbps upgrade but also, I get to be transformed from a reguular blogger to being a Nuffnanger! From now on, I get to stream, download, and play online as much as I want without the hassle disconnection and slow connection! Visit http://www.myworldmydsl.com/ for more information or call 171 to confirm your subscripstion today! Experience PLDT Fibr for 30 Days Free!